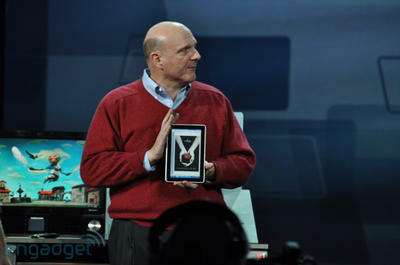 Steve Ballmer took the stage last night in Las Vegas, Nevada setting the stage for CES and talk about what lies ahead for Microsoft in 2010. 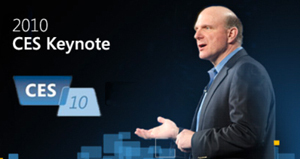 We made some predictions of what we may or may not see, but in case you missed it here’s what went down at Ballmer’s keynote at CES! Touting rave reviews of Windows 7, Ballmer and Ryan Asdourian, Senior Product Manager for Windows, wanted to show off a variety of hardware that’s currently available on the market. We saw HP’s TouchSmart and 24” Sony Viao L all-in-one PCs, the insanely thin Dell Adamo XPS, colorful Acer and Lenovo netbooks, and Asus G51 3D gaming (with glasses!). With emphasis on the cloud, they dove into some of the features Microsoft Office 2010. The two demoed a PowerPoint that allowed collaboration via the web that merges the copies as the drafts are saved. If you haven’t already, download the beta for Microsoft 2010 to get a look into all the features for the upcoming version of Office. Inside Windows Media Center, content providers can create internet apps that display their content in way that makes sense for browsing on your television. Those with cablecard allow users to watch TV without losing normal PC functionality. Microsoft Mediaroom is software that permits IPTV service providers to offer television service without extra hardware. This service is built into Windows 7. AT&T will enable Uverse subscribers to use the service on their Xbox systems later this year. You can also pull content from Mediaroom onto your phone. 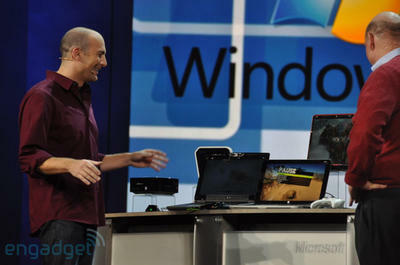 Beyond what’s currently shipping with Windows 7, Ballmer took some time showing new hardware that’s due out later this year. The three devices were all slate PCs; one from HP, Pegatron, and Archos. The recent rumors that HP was behind a Courier-like device were smashed as Ballmer further demoed HP’s tablet prototype running the desktop version of Windows 7. As a whole, the Microsoft keynote was more focused on where they are now rather than what’s ahead. With few suprises being made, fans will have to stay tuned to next month’s Mobile World Congress for more on WinMo and E3 as the launch of Project Natal closes in. With no word on the Courier or anything Zune related, it’s unclear where 2010 will take them. Thoughts?